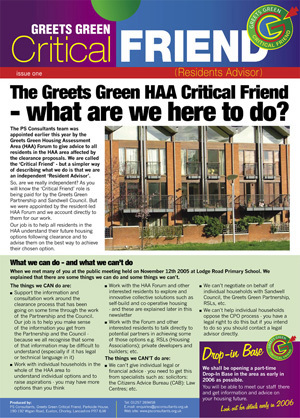 In 2005/6 we acted as ‘Critical Friend’ to approximately 200 homes in the Greets Green area of Sandwell. The area was subject to CPO (Compulsory Purchase Order) and full clearance following a neighbourhood renewal assessment. Our job was to work with residents to advise them on their rights in respect of the CPO process and to support the development of re-housing models (e.g. self build). Although a small community, it was ethnically very diverse and we used simultaneous translation in 6 languages during resident meetings.